The Randy Report: Funny: What If Kevin Spacey Turned To Infomercials? Funny: What If Kevin Spacey Turned To Infomercials? There’s lots of news going on around the upcoming January arraignment of Oscar winner Kevin Spacey regarding allegations of sexual assault. Ever since the explosion of reports of inappropriate sexual misconduct began over a year ago, the bad press has made employment options for Spacey understandably slim. His agents fired him, his publicist fired him, his manager fired him. I mean, what’s he gonna do? Perhaps there’s work to be had as… an infomercial pitchman? 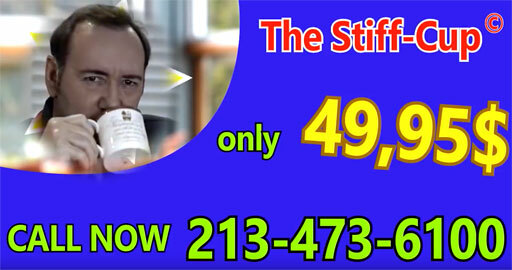 The Stiff Cup is also, apparently, very easy to use (“Wouldn’t that be easy? If it was all so simple?”). For the low, low price of $49.95, you not only get your own Stiff Cup - wait, there’s more - but a beautiful ‘designer ring’ just like the one worn by Spacey in House of Cards. Watch the clever clip below.